Many of you may have noticed that the daily values on your multivitamin changed dramatically for certain vitamins and minerals. 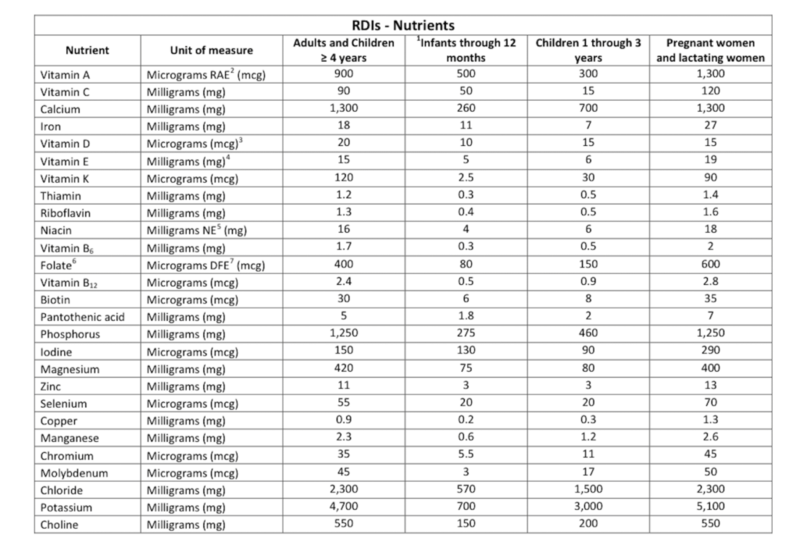 The FDA released a 258-page document that goes over the new Daily Value (DV) and Recommended Daily Intake (RDI) changes. I have done the heavy lifting and sifted through all of it. The FDA states “the updated information is consistent with current data on the associations between nutrients and chronic diseases, health-related conditions, physiological endpoints, and/or maintaining a healthy dietary pattern that reflects current public health conditions in the United States and corresponds to new information on consumer understanding and consumption patterns.” But does it? It is helpful to remember that the FDA takes a broad approach for the entire U.S. with these new recommendations. The true daily value really depends on your diet, lifestyle, environment, and genetic requirements (see Nutrition Genome). For some vitamins and minerals, the DV went down because it has become clear that the majority of people are getting sufficient amounts and too much may be problematic. Some requirements went up due to research showing common deficiencies in the U.S. population. Others got completely ignored despite overwhelming evidence. The FDA has taken into account that people’s sugar intake is higher and “when added sugar intake is 10 to 15 percent of calories, the median intakes of nine nutrients (vitamin A, vitamin E, vitamin C, folate, magnesium, potassium, vitamin K, fiber, and total choline) are significantly lower.” This formula didn’t factor the compounded effects of nutrient depletion caused by a diet higher in sugar. Vitamin D, calcium, potassium, iron, and fiber were also considered as nutrients of public health concern for underconsumption. What the FDA does not take into account is the vitamin and mineral depletion caused by environmental toxins, medications, dietary depleting habits, chemical agriculture and depleted soil, storage and travel of food, and psychological, emotional, physical and biological stress. This guidelines also do not display the different needs of men and women or between major biological stage changes. The FDA has also changed the measurements of certain vitamins and minerals. For example, you no longer see IU for vitamin A, vitamin E, vitamin D and folate is now measured in micrograms DFE. You will also notice that lithium and boron are missing from this chart. Here is The Health Beat’s version of improvements in certain vitamins and minerals that better reflect the current research, optimal intake based on a whole foods diet, and other epigenetic factors (environment, stress) for the general public. I have added a column for ages 4-12 because the current RDI combines 4-12-year-olds and adults, which isn’t accurate. 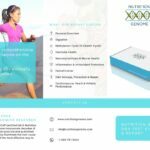 I highly recommend getting a nutrigenomic test done to determine individual requirements. The FDA found that vitamin A “was found in a limited number of foods within the food supply a 1990 IOM labeling report identified vitamin A as a nutrient of potential public health significance and stated that certain subpopulations (children under 5 years of age) were still at risk of deficiency for this vitamin.” However, they concluded that vitamin A is no longer a nutrient of public health significance and so the final rule does not require a declaration of vitamin A on the Nutrition Facts label. 900mcg RAE is equivalent to 6,000 IU of beta-carotene from supplements, 18,000 IU of beta-carotene from food, or 36,000 IU of alpha-carotene or beta-cryptoxanthin from food. This means that a diet containing 900 mcg RAE provides between 3,000 to 36,000 IU of vitamin A, depending on the foods consumed. The conversion of beta-carotene to vitamin A ranges dramatically between people due to genetic variants in BCMO1 (you can see your genotype in the Nutrition Genome Report) and true vitamin A comes from eggs, full-fat dairy, organ meats, cod liver oil, wild salmon oil, and eel. The need for vitamin A is likely going to vary widely between individuals. I think there is an incredible misunderstanding in thinking that scurvy is the only sign of vitamin C deficiency. It was recognized that scurvy is a problem among homeless and the youth, but since they are not buying products, they state vitamin C on labels should be omitted. This is an interesting point in the document because the FDA is looking at the nutrients which influence buying behavior of boxed items. You would think that vitamin C should be a priority nutrient since the population buying boxed items may be less likely to purchase fresh fruits and vegetables to get vitamin C.
It is more accurate to recognize suboptimal levels of vitamin C for health by inflammatory biomarkers, stress tolerance, and immunity. Research has estimated that vitamin C intake during the Paleolithic period was 400mg, and the toxic load in our environment alone today has put us at a higher need for vitamin C today more than ever in history. To recommend only 90mg for the general population is a massive oversight. Read this article on vitamin C to see why this new assessment is incorrect. In setting DRIs for calcium, the FDA reviewed bone health, cancer, cardiovascular disease, and diabetes. Bone health was the only endpoint with sufficient scientific evidence to set a DRI. Therefore, given the benefits of adequate intake on bone health, they concluded that a relatively low intake of calcium (about 49 percent of individuals ages 4 years and older have usual calcium intake from conventional foods below the EAR and 37 percent have intakes from both conventional foods plus supplements below the EAR), and the high prevalence of osteoporosis and osteopenia among the U.S. population. This led to a conclusion of 1300mg daily for both adults and pregnancy, which have different requirements. Studies of pre-agricultural diets show a 1:1 ratio of calcium to magnesium, and represents a time when dairy was non-existent in the diet. The Paleolithic time period serves as an excellent sample to study for bone health due to the superior skeletal structures and teeth observed in archeological digs compared to the Neolithic farmers, who’s high grain intake dramatically harmed their skeletal structures. While vitamin D and calcium absorption varies between individuals based on genetics, modern studies using a Paleo diet have shown that while calcium intake was lower on this diet, magnesium intake was higher, and the lower calcium intake was compensated for by lower calcium and magnesium excretions, which led the authors to speculate that “calcium homeostasis was unlikely to have become compromised.” One of the noncontrolled Paleolithic diet–intervention studies also showed a decrease from baseline in calcium excretion after 10 days consumption of the Paleolithic diet. The researchers concluded that the low-salt, high-protein, and alkalizing properties of Paleo nutrition may substantially contribute to a healthy calcium balance. I propose that the conclusion that poor bone health must be strictly be occurring from calcium intake is incorrect. By increasing calcium requirements to this level, you are increasing your need for magnesium and K2 to prevent calcification. Bone health requires vitamin D, calcium, magnesium, zinc, copper, silicon, vitamin K1, K2, vitamin C, inositol, L-arginine and boron, and the overall diet influences calcium homeostasis. For women, estrogen plays a major role as an antioxidant to protect bone loss from inflammation, which drives osteoporosis in post-menopausal women. However, it would appear that increasing calcium intake to a ratio of 2:1 for calcium: magnesium during pregnancy makes sense because a new skeleton is being built. The FDA found that iron intake is of concern among adolescents and premenopausal females. The amount in the FDA chart did not differentiate between men and women. The data showed that about 14 percent of women of childbearing age (12 to 49 years) had serum ferritin concentration (the major iron storage compounds) less than 15 ng/mL, while 10 and 14.5 percent of women had inadequate stores of body iron based on the body iron model or ferritin model. Additionally, about 3.76 million of these women of childbearing age are considered to have iron deficiency anemia. Heme iron (animal protein) and non-heme iron (plants) have different absorption rates, with heme iron having a much higher absorption rate. Men should avoid supplements with iron, while women may require iron supplementation depending on iron intake. Iron levels that are too low or too high are both damaging to the body. If insufficient iron intake is a concern, then vitamin C should be as well because it increases the absorption of iron. Testing your HFE genes with the Nutrition Genome Report can help determine if you need to be careful regarding iron intake. The new vitamin D measurement uses micrograms instead of I.U. This means that 10mcg = 400IU. A large body of research has found that 2,000IU-4,000IU is the optimal daily dose of vitamin D when deficient, for pregnancy and for seniors. The amount you require may range based on your climate, exposure to the sun, current vitamin D level, and genetics due variants in the CYP2R1 and VDR genes. For a long time, 400IU was the standard amount of vitamin E in many supplements. 1 IU is the biological equivalent of 0.67 mg d-alpha-tocopherol or 0.9 mg of dl-alpha-tocopherol. This was another number that didn’t make sense based on the amount of vitamin E found in food. Vitamin E is fat-soluble and vitamin C recycles vitamin E. If you eat nuts, seeds, and certain vegetables, you may get approximately 15-20mg on a good day. This makes this amount the ideal target. High levels of vitamin E may even be inflammatory for people with certain variants in the GSTP1 gene. 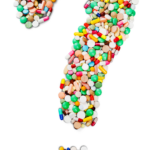 While K1 requirements are established, the FDA document disagrees with including K2 requirements, even though Health Canada makes convincing arguments for the inclusion of it. K1 is found in plants, while K2 is found in natto, goose liver, gouda, and brie. Vitamin K2 is also generated by healthy gut bacteria. When reviewing a food diary of foods high in K2, you will find that the total ranges between 60-70mcg. Low levels of vitamin K2 can lead to arterial calcification, osteoporosis, and poor dental health. Those with variants in the VOKRC1*2 gene may require higher levels of vitamin K2. I discussed B1 with one of our contributors – Sarah Morgan – who has done a lot of work with women and pregnancy. She said that all IVF women have a tremendous need for B1, are consistently low due to oral contraceptives, and that low B1 leads to the accumulation of lactate in the gut that causes nausea vomiting and abdominal pain during pregnancy. High alcohol intake and excessive urination will also lead to low B1 levels. Much attention goes to folate regarding the MTHFR gene, but riboflavin stabilizes the MTHFR gene. Therefore, riboflavin intake should be a priority nutrient for those with variants in MTHFR. Vitamin B6 is one of the most vital nutrients for mental health and has continually found to be low in certain populations. The issue with B6 is it is depleted by many medications, alcohol, sugar and stress. According to the CDC, 10.6 million women use oral contraceptives. Oral contraceptives deplete B6, folate, vitamins B2, B12, vitamin C and E, magnesium, selenium, and zinc. Fresh tuna is a major source of B6, which as a population, we have reduced intake dramatically due to mercury concerns. Turkey and pistachios are other excellent sources. If you have variants in the NBPF3 gene (and many other B6 related genes) you may be more sensitive to low B6 levels for mental and hormone health. Folate is now listed using the unit mcg DFE (Dietary Folate Equivalents). This is the amount of mcg folate ÷ 0.6 = [Amount in mcg DFE]. 800 mcg ÷ 0.6 = 1333 mcg DFE. New labels of 800 mcg of folate will now be reported as 1,333 mcg DFE. This new measurement system came out of a debate between labeling folic acid and folate and almost became FAE (Folic Acid Equivalent). The research actually shows that the frequency of the C677T polymorphism of MTHFR in the Caucasian population is 12% homozygous and up to 50% heterozygous. The homozygous genotype has been found to be particularly common in northern China (20%), southern Italy (26%), and Mexico (32%). Many studies have found issues with folic acid that you can read about here and here. B12 is plentiful in a diet that includes animal foods, and it is stored in the liver. There are five types of B12 found in food. These include adenosylcobalamin, hydroxocobalamin, methylcobalamin, cyanocobalamin, and sulphitocobalamin. Sulphitocobalamin and cyanocobalamin have been found to have the lowest absorption rates. Cyanocobalamin combines a cyanide molecule with cobalamin, and when given in high isolated amounts, high circulating B12 levels on blood tests can occur. As discussed in my Best and Worst Multivitamin article, a study found that very high levels of circulating B12 levels tripled the risk of autism. High B12 levels have also been researched as a marker for cancer. My recommendation is to be conservative with B12 supplementation unless there are issues with absorption, in which case, a stronger formula may be necessary with different forms of B12. Routinely checking your B12 levels when supplementing with higher doses would be wise. For biotin, 300mcg use to be 100% of the DV and is now considered 1,000%. That is a dramatic drop to 30 mcg. Human biotin requirements are actually unknown. We do know that biotin deficiency causes genome instability. The Old DRI of 300mcg was definitely wrong. When you look at the amounts of biotin in food, you will find that 3 oz. of liver has 30mcg, 3 eggs have 30mcg, 6 oz, of salmon has 10mcg, and 6 oz. of grass-fed beef has about 8 mcg. Plant foods contain much less biotin, with 1/4 cup of almonds containing 1.5mcg at the top. As you can see, 300mcg would be impossible on a daily basis. Hitting 30mcg on average each day is a better more accurate target. I applaud this change to 290mcg of iodine for pregnancy. This is in alignment with the research. Iodine has a special role in pregancy, breast health and thyroid health, and due to the competition of iodine intake with fluoride and bromide, increased iodine intake should be considered a priority. Read this article for more about industrial fluoride and how it may be harming you. The commentary from the FDA on magnesium is perhaps one of the most shocking parts of this document. Each section is organized by comments from a committee and then a response from the FDA. I’ll summarize the points here. Comment: One comment said that magnesium deficiency in the face of a normal calcium intake can lead to soft tissue calcification in animals. The comment said that the most prominent feature of magnesium deficiency is the calcification predominantly of arteries. Another comment further stated that magnesium inadequacy has a variety of other adverse health effects and that dietary magnesium intake was found to be inversely associated with mortality risk in individuals at high risk of cardiovascular disease. In addition, the comment said, a higher dietary magnesium intake is associated with lower fasting glucose and insulin and dietary magnesium intake is inversely associated with plasma concentrations of the inflammation indicator C-reactive protein (CRP). One comment stated that national survey data indicate that dietary magnesium intake is inadequate in the general U.S. population, particularly among adolescent girls, adult women, and the elderly. My response: Wow. Heart disease is the leading cause of death in the U.S. and diabetes increases the risk of heart disease dramatically. Read this article on magnesium to see why this is absolutely a nutrient of public health significance. The new RDI lowered zinc from 15mg to 11mg. Why? 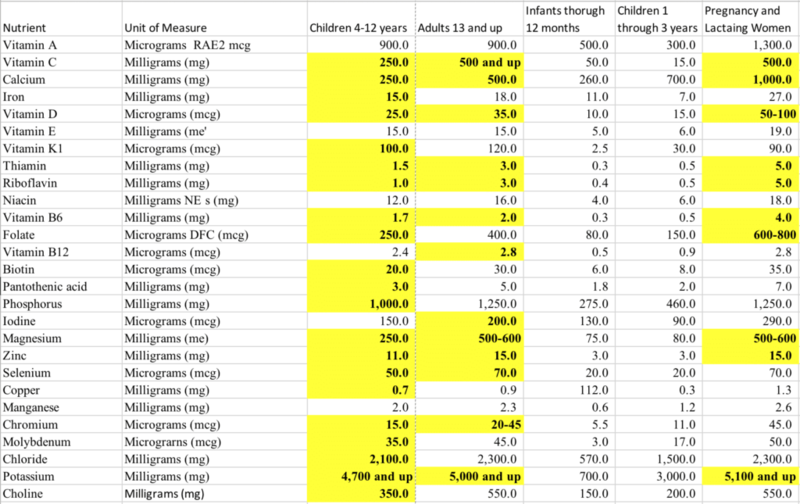 The reasoning appears to be more towards not exceeding a certain level of zinc for children ages 4-8 since they are put in the same category for adults. A study published in 2013 referenced in the FDA document found that a dose-response intervention of 5 to 15 mg/day of zinc for 4 months did not alter copper status in healthy Canadian boys aged 6 to 8 years. Zinc and copper compete for absorption, and the balance between zinc and copper is a key element to overall health. High copper and low zinc can manifest as ADHD, anger, agitation, autism, anxiety, panic, racing thoughts, insomnia, oxidative stress, severe cramps, endometriosis, and fibroids. Due to the use of the copper IUD, estrogen dominance (estrogen retains and accumulates copper, and a sensitivity to both oral contraceptives and the copper IUD can be a clue for high copper levels), low zinc intake, copper fungicides, copper pipes, a vegetarian diet, poor gut health (copper elevates in response to infections). my stance is that the RDI should still be 15mg of zinc for adults while keeping copper at 0.9mcg. The FDA’s response essentially was that they disagree and that no evidence was provided to support the various assertions made, including that Americans need more vitamins and minerals due to increased toxins. I’m not sure which party I’m more upset with on this one. The fact of the matter is, yes, the evidence is overwhelming that we are living in a more toxic environment and that does require a higher intake of protective and detoxifying co-factors to assist our bodies with a toxic load it has never experienced in human history. I agree with this reduction in copper intake as mentioned in the zinc section above. Chromium is a nutrient often discussed in regards to blood sugar control and diabetics. Diets that are high in sugar, infection, intense exercise, pregnancy, lactation and physical trauma all increase chromium losses and can cause deficiencies. Medications like proton pump inhibitors and antacids may lead to low chromium levels. The reduction from 120mcg to 35mcg is quite a drop and it wasn’t clear why this change was made. Chromium is supplied in fairly low amounts in the diet. Broccoli has 11mcg in a half a cup, and 5 oz. of red wine can have up to 13mcg depending on the source of the wine. Other foods are in the 1-3mcg range. It would appear that the FDA realized that 120mcg is much higher than could be supplied by an average diet. 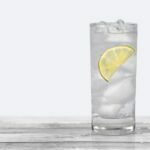 The National Health and Nutrition Examination Survey (NHANES) reported that less than two percent of people in the U.S. meet the daily 4,700-mg potassium. The Paleolithic diet delivered approximately 11,000 milligrams (mg) of potassium a day, much of it from fruits, vegetables, leaves, flowers, roots, and other plant sources, but well under 700 mg of sodium. The average adult now consumes 2,500-7,500 mg of sodium and 2,500 mg a day of potassium. The correct ratio of sodium to potassium in the U.S. has been turned upside down. The curtain has been pulled back on the decades of horrible advice regarding chicken thighs, organ meats, egg yolks and fish eggs due to the fear of dietary cholesterol when all of these foods contain the highest levels of choline. When you review the amounts of choline in food, you will find that it is almost impossible to reach the recommended choline targets without these foods. Choline is a nutrient that I talk about in-depth in the Nutrition Genome Report. Choline is crucial for pregnancy, lowers anxiety, prevents fatty liver, assists detoxification, improves memory and more. Due to variants in the PEMT gene, your choline requirements can vary dramatically, and I think it is a key element in Alzheimer’s progression in women. Both of these were omitted from FDA’s DRI, and lithium wasn’t even mentioned once. Lithium is something many places in the world desperately need more of. Lithium is connected to mental health, nerve health and cancer prevention. As I have talked about here, studies found an association between higher levels of lithium in local water and “beneficial clinical, behavioral, legal and medical outcomes.” Studies in Texas, Japan, Greece, and Austria all found that areas with higher lithium had lower suicide rates. Boron is connected to bone health, hormone health and healthy SAMe levels for brain health. Men with low testosterone women with osteoporosis or osteopenia will benefit from more boron.